There's no such thing as a Gruffalo ... or is there? Find out on this dark ride adventure through the deep dark woods, but be prepared to get wet! The Gruffalo River Ride Adventure is Chessington's major new ride for 2017, a boat ride through scenes based on The Gruffalo children's book by Julia Donaldson. Similar to the book, riders follow a mouse on an adventure through the deep dark woods, encountering animals including a fox, a snake, and an owl along the way. The mouse evades being eaten by describing his friend the Gruffalo, a fictional monstorous creature, half grizzly bear and half buffalo. Of course, the Gruffalo's favourite food happens to be the fox/snake/owl - and they quickly run away scared they may become his next meal. At the climax of the book, and the ride, the mouse chances upon a real Gruffalo who threatens to eat him. Using all his cunning, the mouse takes the Gruffalo with him through the forest, finding each of the animals he previously encountered who immediately flee at the sight of the Gruffalo afraid he may eat them. The mouse though, has a different explanation: that he himself is the scariest animal in the woods. The mouse then threatens to eat the Gruffalo, saving himself as the Gruffalo runs off into the woodland. The Gruffalo River Ride Adventure replaces the much loved Bubbleworks, and uses the same ride system. After the Bubbleworks closed in September 2016, many of its props and theming elements were auctioned off. Merlin's in-house team, Merlin Magic Making, were brought in to develop the new theme and ride scenes. Theming is generally very good, with large 3D models bringing to life the various animals featured in the story. These are supported by digital projections, special effects and smells. 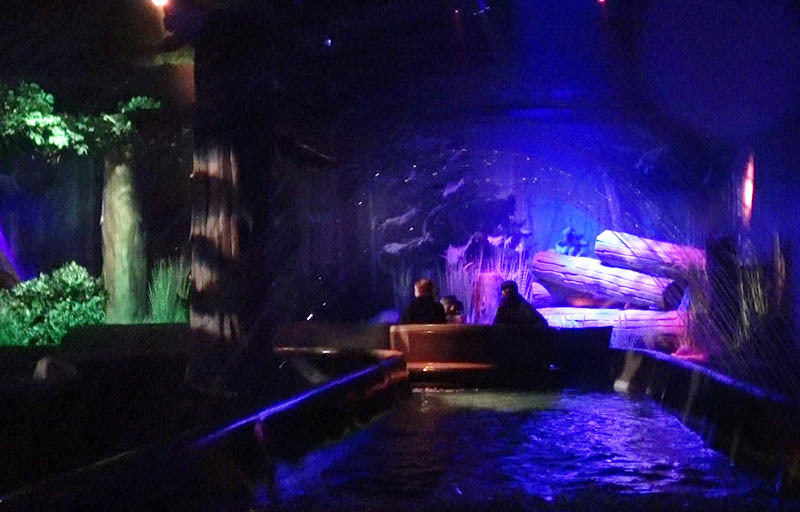 The splash down and fountain tunnels have been retained from the Bubbleworks' famous Fountain Finale, although the boats now travel through a moonlit forest rather than Professor Burp's orchestral display. 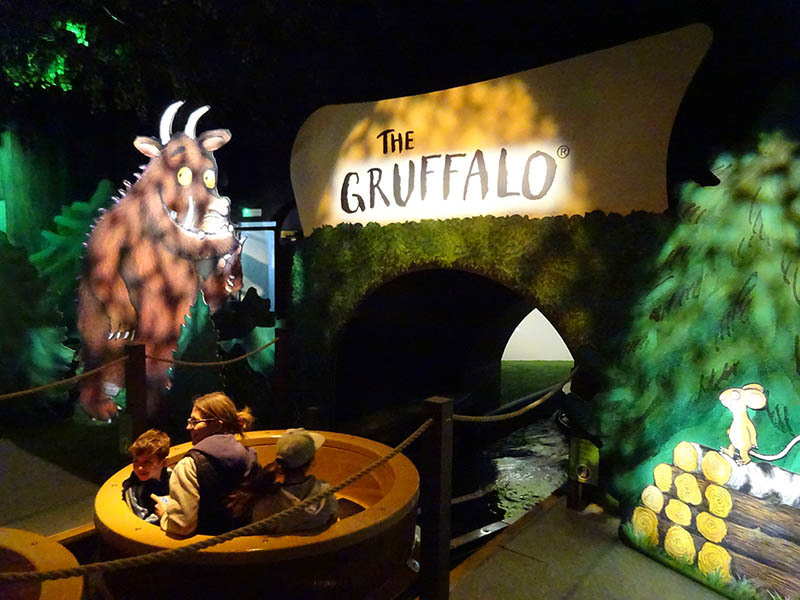 While not coming close to the brilliance of the original Bubbleworks, Chessington have done a great job with The Gruffalo, bringing the dark ride boat adventure to a whole new generation of kids. Although the mouse is adamant "there's no such thing as a Gruffalo", young visitors to Chessington's Wild Woods may come away with other ideas! Oh no, it's a fox! Silly old owl, doesn't he know?